Background: The human cerebral cortex is the outer bumpy surface of the brain pictured at left. It contains 50 to 60 billion cells that regulate every facet of our lives. Our thoughts, sensations, movement, sight, hearing, and other functions, are regulated by the cerebral cortex. The Noctor Lab investigates factors that control formation of the cortex during development from three vantage points: 1) Identifying and understanding how precursor cells produce neurons and glial cells during normal development; 2) Determining how extrinsic factors intersect with developmental programs to produce pathological outcomes; and 3) Using comparative approaches to provide insight on development and evolution of the cerebral cortex. The cortex begins as a very small structure, the anterior pole of a small tube of cells called the neural tube, that is just 200 micrometers – or 7/1000 of an inch – in diameter. Yet that small collection of precursor cells has all the instructions necessary to produce the mature adult brain pictured below on the right. The four images on the left show cross sections of the fetal cerebral cortex at various stages of development from gestation week (GW) 3 through GW21. On the right is an image showing a cross section of the mature adult cerebral cortex. All images are shown at the same scale. The small collection of precursor cells in the neural tube initially undergo many cellular divisions, called symmetric divisions, that increase the number of precursor cells. The precursor cells reside in a proliferative structure called the ventricular zone (VZ), colored red in the schematic drawing below. The VZ precursor cells, called radial glial cells, next undergo asymmetric divisions that produce a secondary precursor cell that migrates superficially away from the ventricle and establishes the subventricular zone (SVZ). 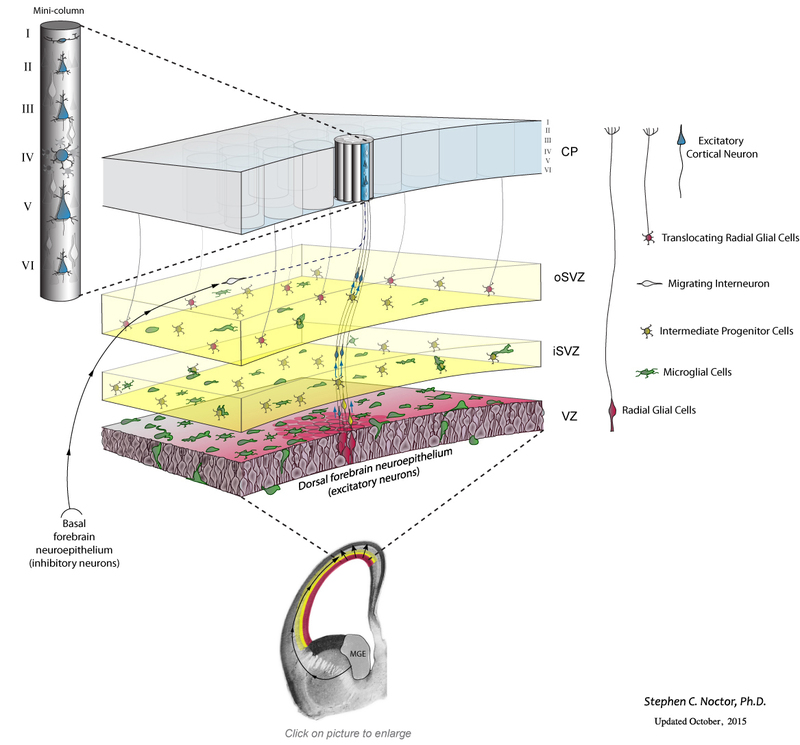 The secondary precursor cells, called intermediate progenitor cells – colored yellow in the schematic drawing below – undergo symmetric terminal divisions that produce pairs of projection neurons (blue) that migrate along radial glial cell pial fibers to the overlying cortical plate (CP). In addition to producing neurons and intermediate progenitor cells in the proliferative zones, some radial glia exit the ventricular zone by translocating along their pial fiber toward the overlying cortical plate. Our evidence indicates that, in the rat, the translocating radial glial cells remain proliferative and produce non-neuronal daughter cells (defined by whole-cell patch-clamp recordings). Many questions remain about translocating radial glia, including: Do all radial glia translocate from the VZ? What is the ultimate cellular fate of translocating RG cells? Which cortical laminae do they populate? 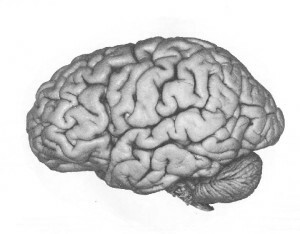 For a few recollections of my first encounters with translocating radial glia click here. Recent work from my lab has shown that this complement of precursor cells is not the entire picture. Microglial cells, immune system cells in the brain, are present in the fetal brain. During cell genesis stages of cortical development, the microglia – colored green in the schematic drawing below – enter the brain and colonize the cerebral cortex. Microglia display an even distribution throughout the mature cerebral cortex, but in the developing cerebral cortex they preferentially colonize the proliferative zones. Our data show that microglia phagocytose precursor cells in the normally developing brain, and suggest that this intercellular phenomenon regulates cell production by controlling precursor cell number. One facet of our work examines neuro-immune interactions in the normally developing brain. We are investigating the regulation of microglial entry into the cerebral cortex, what drives microglial distribution within the cortex, and what controls microglial function in the fetal cerebral cortex. A second major focus of our work is investigating: Whether and how fetal microglial respond to extrinsic challenges; How microglial function in the fetal cerebral cortex may be altered in disease states; and What are the long term implications for the composition and structure of the mature cerebral cortex after immune challenges during fetal development. A third facet of our work centers on comparative studies to delineate shared and distinct features of forebrain development across vertebrate species. Questions being addressed by this work include: What factors contribute to the formation of sulci and gyri in some vertebrate species? How are cortical precursor cells similar, or different, across species? Finally, we continue our efforts to contribute to our understanding of normal features of cell production and migration in the perinatal cerebral cortex… a broad topic indeed!